Authors: C.L Bennett et al. Now is a pretty good time to be a cosmologist. Only a hundred years ago we hadn’t even yet proved the existence of galaxies outside the Milky Way, and now sensitive instruments are probing billions of galaxies extending back to the depths of cosmic time. We now have a detailed theory of what the Universe is made of – “ΛCDM”, for Cold Dark Matter (the “CDM”) plus dark energy (“Λ” after Einstein’s cosmological constant) – and experiments continue to support its detailed predictions. Things get harder in the future; a trillion years from now, the Universe will have expanded so much that cosmology may not even be feasible. But for now, let’s come back to today. The Wilkinson Microwave Anisotropy Probe (WMAP) completed its nine-year mission to measure the small fluctuations in the Cosmic Microwave Background (CMB), and the WMAP team has just released their final analysis. When combined with data from other cosmology experiments, these results are fully consistent to high precision with ΛCDM: they tell us we live in a spatially flat Universe that is about 13.77 billion years old, and that it consists mostly of dark energy, has much more dark matter than baryonic matter, and is expanding at an ever-increasing rate. WMAP studied the cosmic microwave background (CMB), which, as discussed in several previous astrobites, is the imprint of recombination. Recombination was the time when the Universe had cooled enough for electrons and protons to combine into stable hydrogen atoms; prior to that time, photons were almost immediately scattered by free electrons via Thomson scattering. 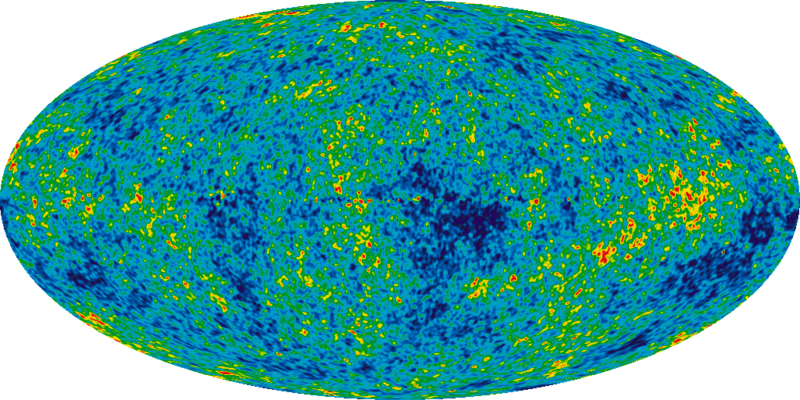 The CMB is perhaps the most fundamental observational probe of cosmology; for example, the small (1 part in 104) anisotropies probed by WMAP are relics of the density perturbations that existed on top of the otherwise smooth, homogenous early Universe (see the full-sky map in the results section below). are dimensionless numbers in units of the critical density of the Universe. The critical density is the total energy density required to make the Universe spatially geometrically flat. In a flat universe, Ωb+ Ωc+ ΩΛ=1*, allowing WMAP to directly measure the geometry of the universe on large scales by measuring these parameters. WMAP also measures three additional parameters: the first two describe the amplitude and slope of the matter power spectrum, and the third is the optical depth at the time of reionization. I won’t discuss these any further in this article, as they require significant background explanation; for more details, have a look at the discussion in Hinshaw et al. 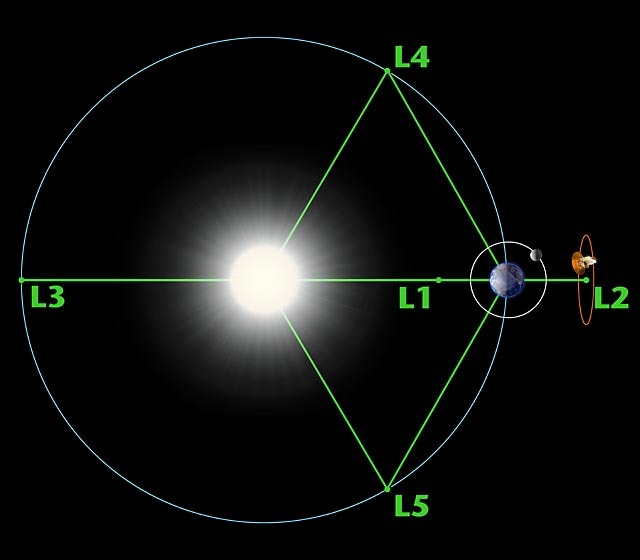 The WMAP satellite was proposed in 1995, accepted in 1996, and launched in 2001 into an orbit at the (marginally) gravitationally stable Lagrangian point L2, behind the Earth with respect to the Sun (see this diagram and the picture below). The experiment was initially supposed to last two years, but its early success garnered repeated extensions, ultimately resulting in a nine-year mission that ended in 2010. WMAP surveyed the entire sky in full polarization roughly every six months over its observing lifetime, measuring CMB anisotropies at 0.2-0.9° angular resolution to an astounding accuracy of one millionth of a degree in temperature. It operated at radio frequencies from about 20-100 GHz, where the CMB signal is the strongest compared to foreground emission (such as synchrotron radiation from the galactic plane). 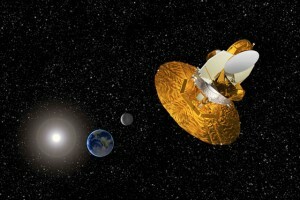 The WMAP satellite at L2 (artist's conception). Image courtesy of http://map.gsfc.nasa.gov/. The papers discussed here present the final results from the WMAP team. WMAP had previously released data after three, five, and seven years, each time refining their analysis, combining more data, and reducing the uncertainties on their parameter estimates. 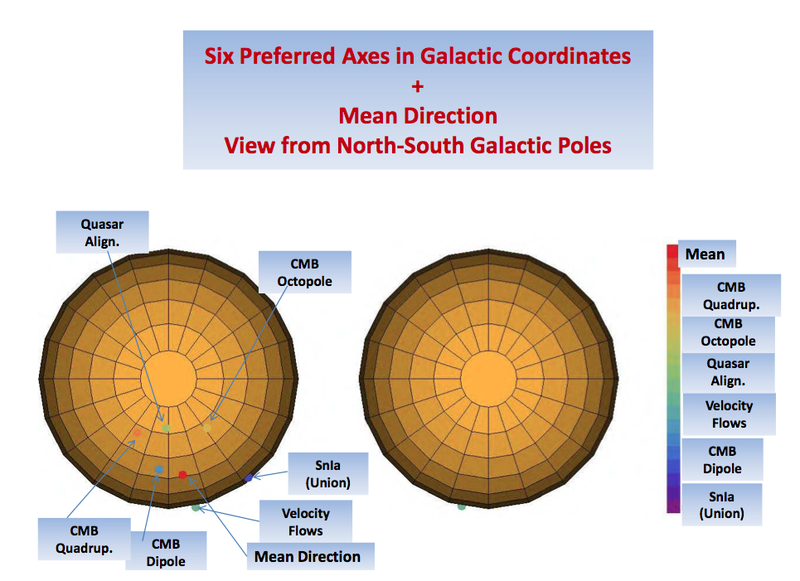 In these final results, the team also incorporates measurements from other CMB experiments (the South Pole Telescope and Atacama Cosmology Telescope), from studies of Baryon Acoustic Oscillations (BAO; such as BOSS), and from other measurements of the expansion of the Universe, such as those using Type 1a supernovae. The WMAP analysis is based on Markov Chain Monte Carlo (MCMC) methods (see this astrobite for an example MCMC code), and produces a maximum likelihood value and uncertainty range for each fit parameter listed above. The modeling accounts in detail for the different foreground components and for the possibility of correlated errors. The end result of the process is the CMB power spectrum, which plots the amplitude of CMB fluctuations as a function of the multipole moment l. l is essentially an inverse length, and so small l corresponds to large angular scales on the sky, while large l refers to the smallest scales. In the final results presented here, the optimal estimator method is used; this procedure was previously too computationally intensive, but new algorithmic developments allowed it to be implemented here for the first time (see Bennett et al. for details). The end result is a much lower set of uncertainties on the cosmological parameters. The final foreground-subtracted WMAP all-sky map of the CMB anisotropies is depicted below. The temperature anisotropies measured are parts per million of the background CMB temperature. All-sky map of the anisotropies in the Cosmic Microwave Background as measured by WMAP. The galactic foreground has been subtracted. The colorscale ranges from -200 to +200 μK, as compared to the background CMB temperature of 2.7 K: the relative scale of the anisotropies is only about one part in ten thousand. Image courtesy of http://map.gsfc.nasa.gov/. The nine-year WMAP power spectrum is shown here, along with additional data from two ground-based CMB experiments. The fit is only to the WMAP data, but it also very accurately predicts the smaller scale (i.e. larger l) measurements, demonstrating the robustness of the ΛCDM model. 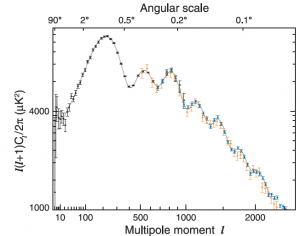 CMB power spectrum: amplitude of fluctuations as a function of angular scale. The WMAP nine-year data are in black (note the tiny error bars), and the gray line is the ΛCDM fit to these data. The same set of ΛCDM parameters accurately predicts the South Pole Telescope (blue) and Atacama Cosmology Telescope (orange) measurements (Figure 1 from Hinshaw et al.). The team first fits just the WMAP data alone, then combines these data with the other measurements described above, first one at a time, then finally including CMB, BAO, and H0 (expansion of the Universe) methods. In all cases, the maximum likelihood estimates for the six cosmological parameters are in mutual agreement to within the uncertainties. The executive summary is that at the present day, only 4.6% of the Universe consists of baryons, 24.0% is dark matter, and the remaining 71.4% is dark energy. The scalar spectral index ns is excluded from implying a constant slope with 99.999% confidence, meaning that the amplitude of perturbations is not flat as a function of spatial scale. This result matches one of the important predictions of the theory of inflation. Using the derived cosmological parameters, a number of other quantities that depend on these parameters can be directly calculated, such as the age of the Universe, the Hubble constant, and the epoch of reionization. The WMAP results combined with the other measurements imply an age of 13.77 ± 0.06 billion years – the most accurate estimate ever calculated – and a Hubble constant of 69.3, in relative agreement with determinations from BAO and type 1a supernovae. The WMAP results also suggest that reionization actually happened slightly earlier than previously predicted – at a redshift of 10.1 ± 1.0. The fact that we keep finding galaxies farther and farther back in cosmic time seems to support this idea. The WMAP results can also be combined with the additional data to constrain additional cosmological parameters, including the dark energy equation of state (we still think it’s a constant), the tensor-to-scalar ratio (the upper limit has been further decreased), and tests of Big Bang Nucleosynthesis such as the number of neutrino species and the primordial abundance of Helium (these both seem to match the standard predictions). WMAP has truly come to define what is meant by “precision cosmology.” Thanks to this historic experiment and the team of scientists behind it, we now know a whole lot about how our Universe formed and evolved. It is indeed a good time to be a cosmologist. And with the current and upcoming crop of experiments (such as Planck, BICEP2, and JWST) poised to take the level of precision even higher, it is only going to get better in the near future. * This is only really true today; at early times, radiation contributed significantly to the energy density.